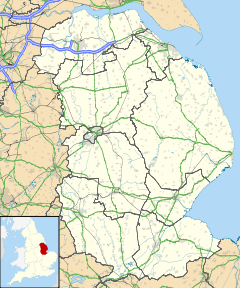 In 1185, Roger de Maletoth gave a bovate, around 20 acres of land, at Scamblesby, to the Knights Templar. In 1507, the prebend of Scamblesby was held by Polydore Vergil, an Italian historian and priest, who had moved to England in 1502. Vergil held the prebend until 1513 but lived mainly in London. In 1672, Herbert Thorndike, Canon of Westminster Abbey, left the 'lands and tenements' he owned in Scamblesby, to be held in trust, to provide a 'perpetual vicarage' for the local church. The village Anglican parish church is dedicated to St Martin. It was partially rebuilt in the 1890s and seats around 100. ^ Farrer, William. Honors and Knights' Fees: Chester, Huntingdon. Printed for the author, by Spottiswoode, Ballntyne & co. p. 172. ^ Atkinson, Catherine (2007). Inventing Inventors in Renaissance Europe: Polydore Vergil's De Inventoribus Rerum. Mohr Siebeck. p. 291. ISBN 978-3-16-149187-0. ^ Ferguson, John; Alexander, Elizabeth H. (1932). "otes on the Work of Polydore Vergil "De Inventoribus Rerum"". Isis. 17 (1): 71–93. doi:10.1086/346638. JSTOR 224628. ^ Kennett, White (bp. of Peterborough.) (1704). The case of impropriations, and of the augmentation of vicarages ... stated by history and law [by W. Kennett.]. [interleaved and with the author's MS. additions]. pp. 72–73. ^ "Scamblesby Church of England Primary School". BBC. 6 December 2007. Retrieved 13 January 2008. This page was last edited on 1 February 2019, at 13:01 (UTC).